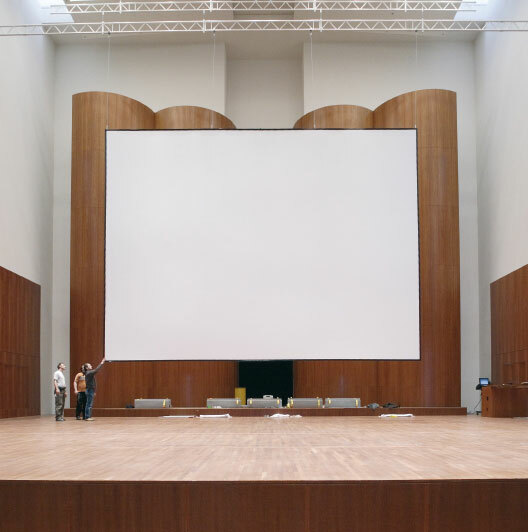 What is a Projection Screen? A surface, usually glass, vinyl, acrylic or PVC, used to reflect light or transmit light through its surface. There are a few differences between front and rear projection screens, concerning both the use and the resulting image that is visible on the screen. Not every projection fabric is feasible for every use. Read below to find out, which projection screen best suits your needs. Front projection is a method of bouncing or reflecting light off the front surface of the projection screen. Light sources can be a projector, traditional lighting fixture (ellipsoidal's, fresnel's, parcan's) or intelligent moving lights. The light source and viewer are on the same side of the screen, thus the viewer is looking at reflected light. Matte-white front projection screens are typically designed to evenly maintain image brightness, clarity and contrast across its surface. High-gain front projection screens (gain value of over 1.0) typically are brighter on center axis than matte white screens and fall off (lose brightness and clarity) at the sides. As with both front and rear projection, controlling ambient light (all light in the space produced by sources other than the screen) will be crucial when trying to maintain image brightness. Cinema screens are usually front projection screens. No need for projector placement behind screen. Large, light colored surface attracts ambient light. Shadows can be cast by performers and/or scenery. Typically brighter projectors needed when other lighting is on stage (ambient light) at same time projection is on. Rear projection is a method of transmitting light through the surface of the projection screen. Light sources can be a projector, traditional lighting fixture (ellipsoidal's, fresnel's, parcan's) or intelligent moving lights placed behind the rear projection screen. The light source is on the opposite side of the viewer, thus the viewer is looking at transmitted light through the projection surface. 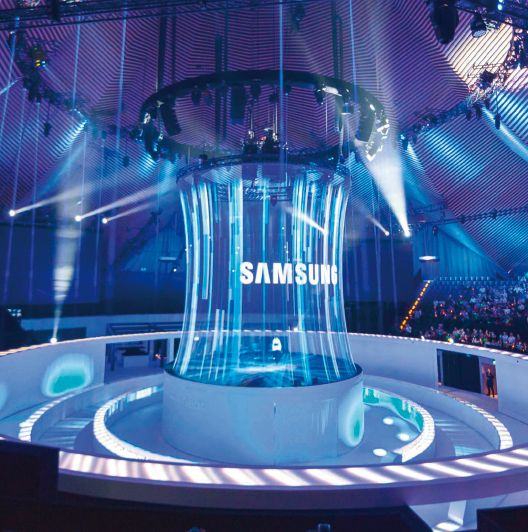 There are several types of rear projection screens ranging from very bright, narrow viewing areas to very even, wide viewing areas. Several factors must be considered when deciding which rear projection screen to use such as the type of projector being used, the brightness of the projector, projector placement/distance relative to the screen surface, ambient light level, viewing cone needed and color of the screen. Ambient light less of a concern as compared to front projection because color is typically grey or black (does not reflect as much light as a light colored surface). No need to worry about shadows cast from projector. Screen tends to “disappear” when image is not projected due to darker color. Projector placement behind screen - Sometimes space is not available. Some “hot spotting” may occur depending on screen surface used. Most Gerriets projection screens are custom manufactured to the customer‘s specification. Our high-frequency welding process allows the production of custom projection screens in almost any shape and size. There is no limit to the width of a screen, but there are practical and physical limitations to height. For screens that are higher than they are wide, we generally recommend reinforced screen materials to prevent "hour-glassing" on the sides and sagging in the middle. Unfortunately, reinforced screen material is only available for front projection screens. The overall weight of the screen should be considered when planning or purchasing a custom size projection screen. Gerriets employs a state-of-the-art high-frequency welding process to manufacture top-quality, professional welded projection screens. This process encompasses several steps which produce nearly invisible seams. This method also allows the production of high-gloss vinyl film and other PVC screens. Inflatable screens with air valves are also available. Most of our projection screens have a slight embossing on one side that helps direct the light that is projected on or transmitted through the screen. For both front and rear projection, the screen’s embossing should always face the viewer/audience. An easy way to identify the embossed side of any custom-made Gerriets projection screen is to look for the grommet/eyelet marked with the Gerriets name. Hanging:For a projected image to look good, the screen surface must be flat and wrinkle free. A common misconception is to think that the screen needs to be tensioned on all 4 sides to produce a flat, taught surface. Gerriets projection screens will hang out flat and wrinkle free in about 8 hours when tied onto a pipe or truss at the top edge and weighted in the bottom with a pipe (typical hanging method for most theatrical drops ). Of course if the screen has an odd shape (circle, triangle, oval) it must be tensioned within a frame system. If there is not a means to hang a screen from the top edge, then a rigid frame system must be used to keep the screen taught to yield the best possible image. Truss Frame: The screen can be secured on all four sides to a box truss frame, typically the screen will have grommets spaced frequently along each side of the screen to insure proper tension of the screen. The screen will normally be secured to the frame using bungee cord fasteners, like our Spannfix Bungee Cords. Stapling or Tacking: Usually used to mount smaller size, raw edge screens to flats or wooden frames to be integrated into scenery or exhibits. 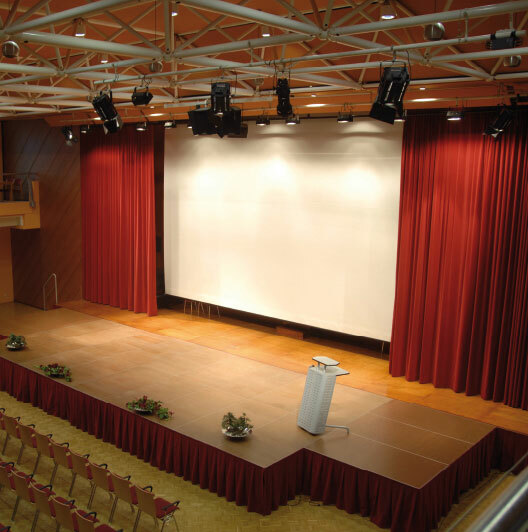 Perforation and Microperforation: Perforation or microperforation is typically used to help alleviate acoustic pressure through a projection screen, particularly middle to high range frequencies. Standard perforation is 57,000 holes/m² (37 holes/in²) with an open area of approximately 7 %; micro-perforation is 300,000 holes/m² (195 holes/in²) with an open area of approximately 6 %. For a relatively close viewing distance, a microperforated screen such as GAMMALUX® MICRO is recommended. For farther viewing distances, a standard perforated screen such as OPERA® white Perforated is recommended. Under proper viewing distances and conditions, perforation is not visible. Soft-Edge Projection: With soft-edge blending, media software is used to control the intensity of projected light in the overlapping portion of a picture being projected from two or more projectors. This ensures a smooth seamless image. Media software can control only the projectors, not the surface. The overall success of any system depends as much upon the projection surface as it does on the media software. Variables such as the luminance factor (gain) and viewing angle are critical to smooth, blended images. Soft-edge projections work best when the screen delivers uniform luminance across the entire viewing angle. Screens with a high gain and unfavorable luminance distribution will result in darker, uneven areas at the image overlap. Both OPERA® creamy-white (gain 0.32) and OPERA® grey-blue (gain 0.26) work well due to the very even luminance distribution across the entire viewing angle. Even better is TRANSMISSION rear projection screen, with its combination of high luminance (gain 1.13) and even luminance distribution across the entire viewing angle. 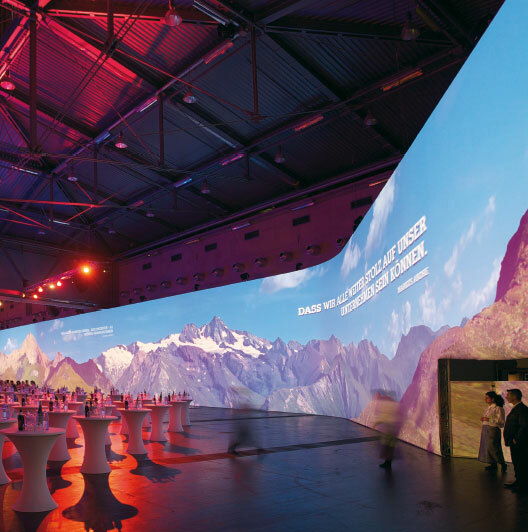 Gerriets OPERA® creamy white and REVUE projection screens can be digitally printed to produce visually stunning, translucent backdrops. They can be used as innovative advertising media or as scenic elements or theatre screens in opera, dance, theatre, television, events and exhibition applications. The combination of high frequency welding and a specially designed digital printing process allows the reproduction of large scale scenery or works of art with nearly invisible seams. Ever-changing atmospheric backgrounds are possible simply by changing the front or rear illumination of all or part of the screen. When vast expanses of illuminated backdrops are brought to life with lighting effects, audiences are transported to a different world. Gerriets representatives are ready to assist you with the numerous possibilities of these products. Flameproofed to DIN 4102 B1 and NFPA 701. Shipping: Custom manufactured Gerriets projection screens are delivered folded in a box / crate as standard. After use, you may pack the foldable projection screen in a similar way for storage. Folding may cause crease marks or wrinkles which generally disappear in use. Gerriets assumes no responsibility if all wrinkles do not fall out for reasons beyond our control such as delivery method or length of time in storage. To assure wrinkle-free delivery, we offer screens rolled on a tube as an option. There is an additional charge for rolling and should be specified at time of order. 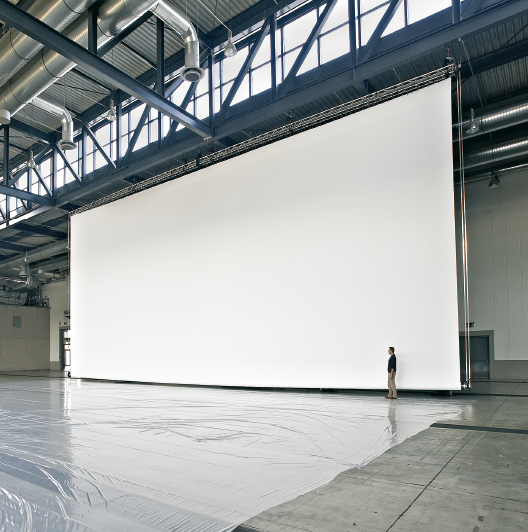 Due to the practical limitations of shipping, not all projection screens can be rolled. Tensioning and temperature: The PVC screen material is thermoelastic. Dimension changes can occur due to temperature and atmospheric fluctuations. 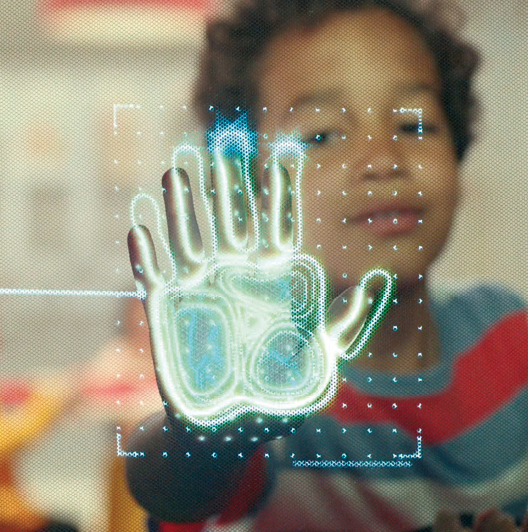 Our dimension information always refers to the outside dimensions of the screen. If tensioning the screen, please subtract one percent of the untensioned dimension to allow for stretch. Also projection screens are sensitive to cold and should be unpacked and handled only at ambient room temperature.